General Principal says that amount you spend for personal or family reasons are not deductible business expenses. However, if you are doing business from home or have a family business, there are expenses which are both in the nature of personal expenses and also business expenses. The Indian Income Tax Provision allows deduction of these expenses, primarily in the nature of business, in other words, expenses which enable the business to sustain and grow. Businesses can leverage by claiming these expenses for business, resulting in legitimate tax planning, however, the distinction may be difficult to make. The best methodology to find out whether a particular expense qualifies as a business expense rather than a personal one, ask yourself whether you would still have to incur the expense, if you don’t run the business? If you have a small business and use a portion in your home for such business, whether it is a room, a portion of the room, a garage, a storage room, the expenses incurred for such area can be claimed as business expenses. The expenses incurred may include rent, interest, repairs, utilities and depreciation. These expenses can be claimed according to the portion of usage of home for business purpose. Further, if you have a house keeper for cleaning and maintenance of the house (including the area of business at home), the expenses for such service can also be shown as business expense accordingly. If you use your personal car exclusively for business purpose then you can claim the expenses incurred for fuel, repairs & maintenance, insurance, registration, depreciation as business expenses. Further, if you use it partly for business and partly for personal then you can claim an estimated expenses incurred for business purpose. If you are an employer and you make re-imbursement to your employee for the use of his vehicle for business, is can also be shown as business expenses. Most people are in the business wherein they have to travel a lot, whether it is within the state, outside the state or outside the country. Such expenses may include travel fare (car hire, air fare, rail fare, bus fare, and taxi fare), accommodation expenses, food expenses and business activity expenses. These expenses can be shown as business expenses to the extent it is incurred for business purpose. Every business makes a use of phone for communication purpose. Mobile and landlines are often used to communicate between clients, customers or business associates. This expense can also be shown as business expenses. Further, there may be cases wherein mobile is used for business as well as personal purpose. In such case an estimated amount can be shown as business expense. All work and no play makes Jack a dull boy. So is the case in business. To improve productivity, motivation, efficiency, team spirit among the employees most of the business organizations have arrangements for entertainments. Such entertainment may include indoor games, In-house party, food & drinks, movies, etc. These are very helpful for the growth of the business and for maintaining a better and healthy environment within the organization. These expenses also form a part of business expense as it is incurred for the benefit of the business. Further, expenses incurred for the maintenance of greenery or a better infrastructure can also be shown as business expense. Internet is widely used in business organization especially in case of IT organization wherein the whole business is based on internet. People use it for accessing mails, research and development, web hosting, maintenance of website, etc. Such expenses can be included as business expense. In home business internet is used for personal as well as business purpose. In such case expenses can be claimed accordingly. There are expenses, such as hosting charges, web-applications, travel expenses, for which payment is made from personal credit card of the entrepreneurs. There should a proper allocation of those expenses between personal and businesses, and expenses related to the business can be claimed to lower taxes. You should never shy away from taking a deduction you are legally entitled to claim. However, at times these deductions are subject matter of litigation with the Indian Tax department, IT department being very skeptical about these expenses in the absence clear set of governing rules in this regard. Thus, it is essential for businesses to have a basis for claiming these expenses fully backed with meticulous records. 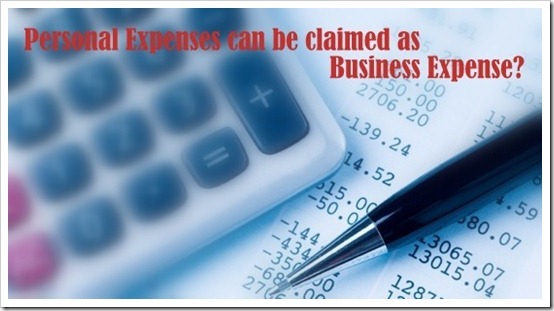 "Can Personal Expenses Be Shown As Business Expenses In Filing Income Tax? ", 5 out of 5 based on 1 ratings. Is there any limit on expense on Vehical fuel, meals & entertainment for person who has working alone and created a company with partnership? My wife is doing Medical Transcription from home for which power, internet, computer maintenance, conveyance expenses are there and also uses a prepaid mobile for which no bills are issued while recharging, ditto for when there are small expenses for computer maintenance for which no bills are issued, power is also used but as it is from the house she does not claim any expenses for the said profession is it fair to generate self made vouchers for such small expenses and how much of the professional income will safely qualify for a business expenditure? Finally how much entertainment is allowable and sometimes the petrol bills fade away very quickly then what is the best way out here as it is not possible to xerox the bill every time. I am totally agreed with you if someone is coming in limit of income tax then he/she shouldn’t feel any shy to fill amount because this amount will help for you better than the best in future.